ERGH!!! After several days experiencing a personal "story retreat", I've come to the unfortunate realization that, in order for this epic story to work, I need to make the audience hate the person that kills Dracula. Lil' Drac would have to kill the man who killed his father, but his father killed a bunch of villagers that didn't really do anything to deserve it....so....looks like I'll be shelving my Lil' Drac resurrection story...for now, at least. 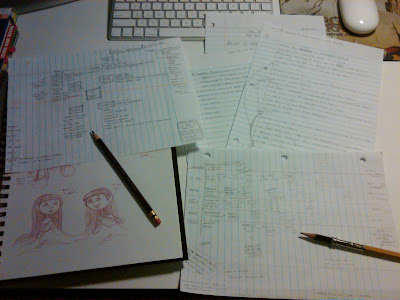 Grrr...look at all those wasted notes and story sketches!